Hands down, some of the coolest species you can have in your home aquarium are freshwater crabs. When most of us think about crabs, we picture saltwater environments. 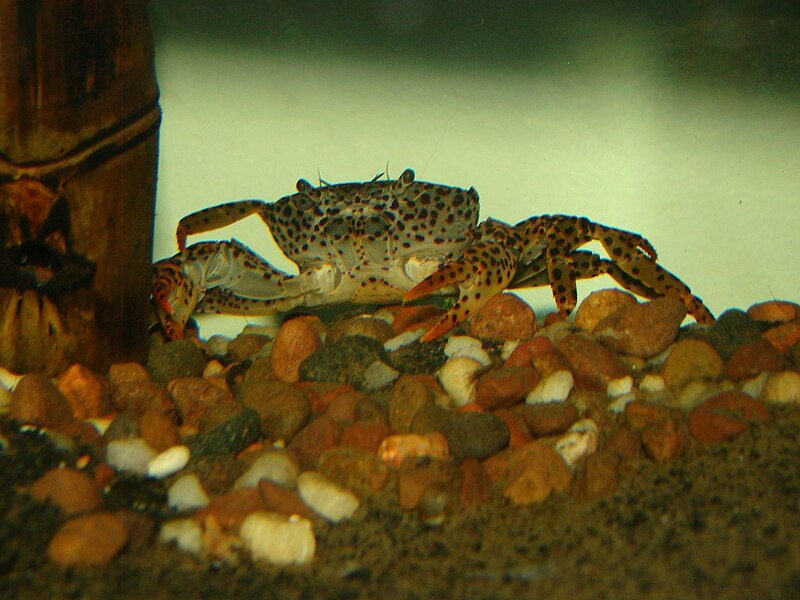 However, there are several types of brackish and freshwater crabs that can thrive in your freshwater tank. Crabs are scavengers, and it’s fun to watch them make their way around the tank collecting whatever goodies they find floating around. It’s not just amusing, either. Crabs can really help keep your tank clean. While most people decide which kind of crab they want based on looks, take a moment to learn about each one before committing. Each one is slightly different, with varying traits and requirements. 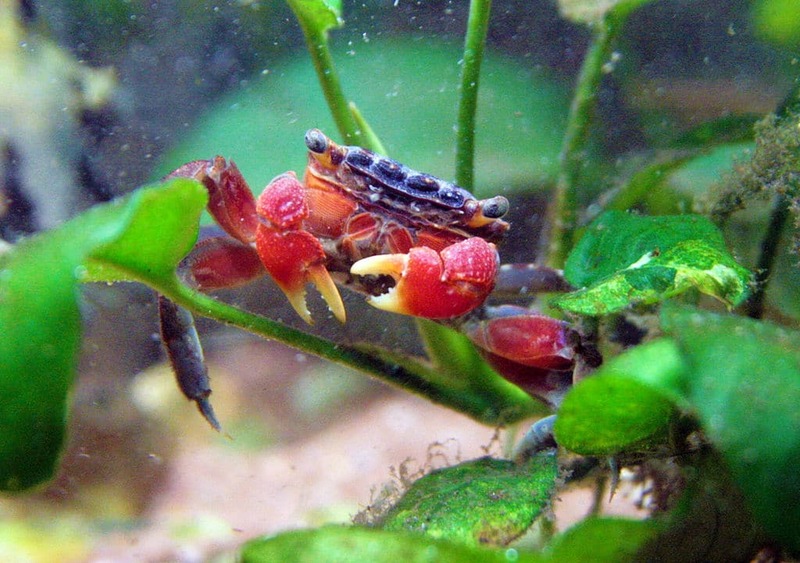 It’s not uncommon to see a Red Claw crab in freshwater aquariums; they are one of the more popular and readily available varieties. Red claws grow to be around 2-4 inches and can live for up to 5 years when kept in ideal conditions. The name, of course, comes from their signature red-colored claws. In the wild, Red Claw crabs live in brackish water. However, some breeders and even some pet stores keep them in freshwater. If you want to give this species the best chance of living a long and healthy life, create a brackish water habitat for them. All crabs are climbers, but Red Claws are known for being particularly adept at scaling rocks and other tank decor. They’re also excellent escape artists, perhaps even more so than other crabs. Fiddlers are quite small, and usually don’t grow any larger than 2 inches. They are incredibly striking to look at. One claw is proportionate to the crab’s body, small and delicate. The other claw, however, stands way out and is dramatically larger than the other. This oversized claw is also brightly colored – often a bright yellow or gold. 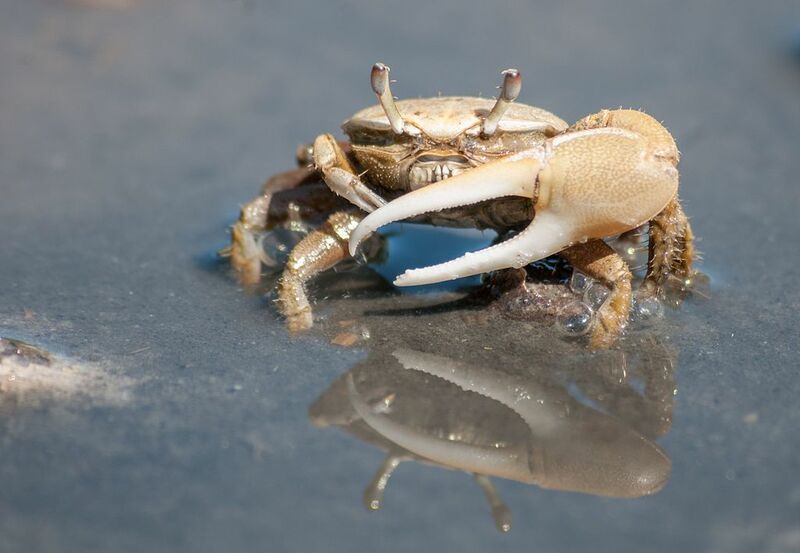 Fiddler crabs usually aren’t very aggressive. The do like to travel in pairs or small groups, so purchase at least two of them at a time. Like most crabs, these little critters love to hide out. Since they’re so small, you may have to look behind rocks and aquarium decorations to find them sometimes. Fiddlers live relatively long lives in the wild, but genreally have a lifespan of just a few years in captivity. Keep in mind that the term “Fiddler Crab” encompasses some 100 individual – but similar – species. These little devils are actually pretty angelic, as far as aquarium pets go. They’re definitely on the more docile side, making good companions for other peaceful tank-dwellers. Thai Devil crabs generally measure about 2 -3 inches at adulthood, although certain varieties may get to be around 4 inches. Thai Devil crabs come in a variety of rich colors, including deep reds and purples. They can live up to 15 years (though that is definitely on the higher end of the scale, since many only live 5 years or so). Vampire crabs are a really fun species to keep. They’re also fairly rare and likely more difficult to find than other types of freshwater crabs. They come in a variety of colors, usually vivid shades of orange, purple, or red. The scary-sounding name comes from the fact that they have unique yellow eyes that are sometimes described as “glowing.” If you were hoping for a blood-sucking crustacean, sorry to disappoint. Vampire crabs are small, measuring in at around an inch wide. They typically live for up to 3 years when lovingly cared for. If you’re interested in getting some Vampire crabs, note that you’ll need to provide a very specific habitat. This species is not fully aquatic. In fact, they need more dry land in their tank than water. Like most crabs, Vampire crabs will eat lots of things – so be sure to provide them a diverse diet with both plant matter and animal protein. Pom Pom crabs are also somewhat rare, having made their debut in the captive breeding circuit in recent years. In the wild, these crabs are often seen scuttling around with anemones clasped in their claws. 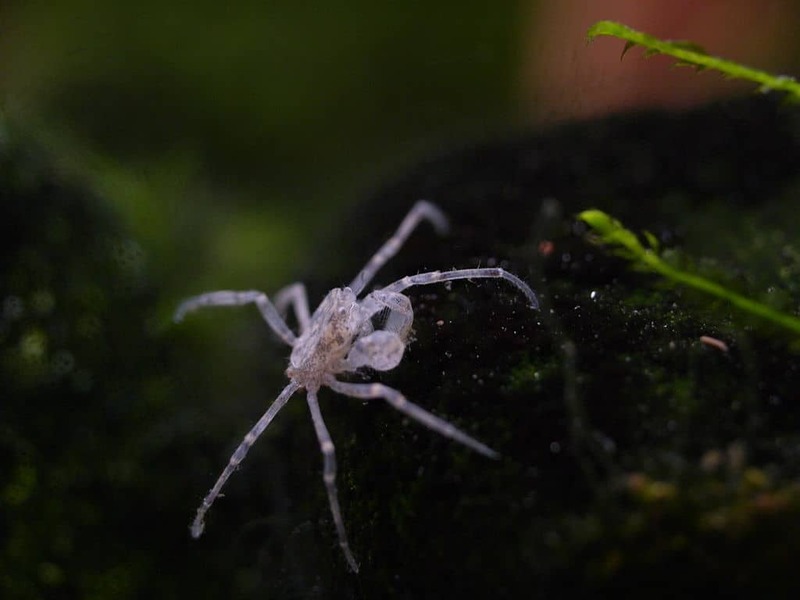 This makes them look a bit like they are holding tiny pom poms, which is really adorable – and also how this freshwater crab variety gets its name. Pom Pom crabs are very small, with especially delicate exoskeletons. Many will only reach 1 inch at adulthood, though some may get as big as 1 ¾ inches. They are totally aquatic, and not difficult to care for. The Thai Micro crab is sometimes called the False Spider crab. These names are apt, since this species is so incredibly tiny. They measure at about 1 centimeter (less than half an inch!) in diameter. They are usually brownish or gray, with long spindly legs – much like an actual spider. They’re also covered in very small hairs, which serve the important purpose of helping them gather food that floats by in the water. Thai Micro crabs are very sensitive to changes in water conditions. Since they are so small and fragile, there’s not much they’d be able to do if confronted by a predatory neighbor. That’s why it’s important to keep them in tanks with only the most docile companions possible. Small invertebrates can often live peacefully with Thai Micro crabs. Some species of small schooling fish may also cohabitate well with them. Micro crabs aren’t particularly outgoing, and they may spend a good part of the day hiding out. Aquarium crabs are known for escaping enclosures. When they’re this tiny, the risk is even greater. Take extra precautions to ensure there are no small openings in your tank that could serve as an escape route for a wayward crab. 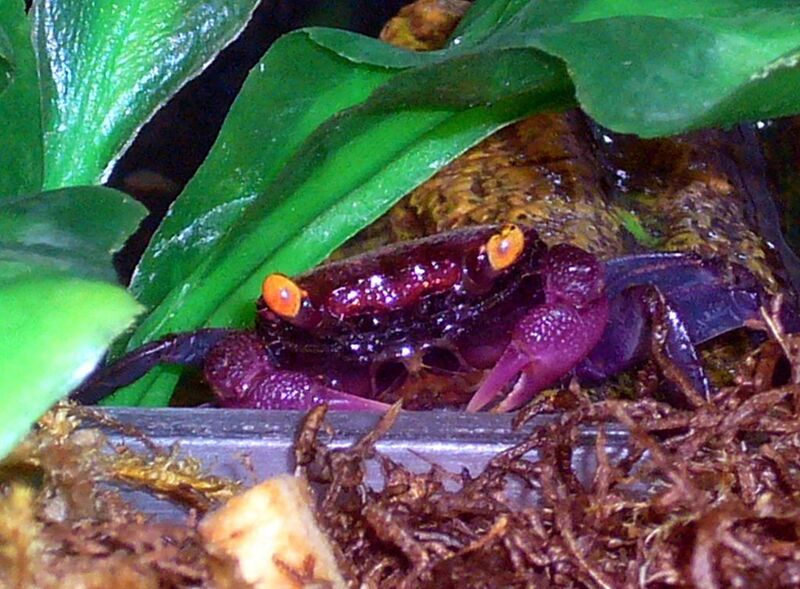 Panther crabs can get to be more than 3 inches wide at maturity. They been known to live for up to 5 years in captivity. Panthers are quite a bit more aggressive and territorial than the other aquarium crabs listed here. They’ll often fight amongst themselves, as well as with other tankmates. If you place them together, it’s best to choose a male/female pair or even a harem as two males will almost surely fight. Panther crabs are named because of the jungle cat aesthetic of their shell, which is yellow with black or brown spotting. While it might seem intimidating, taking care of freshwater aquarium crabs isn’t incredibly difficult. In fact, crabs are easier to care for than many types of fish. Before inviting a freshwater aquarium crab into your home, get everything you need to provide a healthy, comfortable living space for your new friend. First, get yourself a suitable tank. The absolute smallest aquarium you should use is 5 gallons; 10 is better. In fact, it’s best to get the biggest aquarium that can fit in the space you have available. That way, your crabs won’t be cramped as they grow – and you’ll have room to incorporate more tankmates later on. Most aquarium crabs are not 100% aquatic, so they need a bit of dry land in their tank. In general, a good ratio is 2 parts water to 1 part land. This can vary by species, though. You can use sand, rocks, and other elements to build a dry area inside your aquarium. One easy method is to simply pour sand into the tank, piling it much higher in one area to create a little beach for your crab. Conversely, you can purchase ready-made setups online and in pet stores.If your tank will exclusively house Freshwater Pom Pom crabs and/or other fully aquatic species, you don’t need to create a dry area in the aquarium. Place your tank in a warm area that is not under direct sunlight (which can be harmful to aquarium crabs. Once you’ve built up a dry area, you can fill the aquatic section with water.If the water becomes dirty after pouring it into the sand, just give allow some time for it to settle before placing any crabs inside.If you prefer, you can place a large container in the lower section of the tank and fill that with water instead of pouring it directly into the aquarium. You must use water that has been filtered. This is extremely important because tap water contains chlorine, which can be dangerous to crabs. Crabs like warmer water, usually between 72 and 82 degrees. This can be monitored by placing an aquarium thermometer in the water-filled section of the tank. Ask the breeder or pet store for specific temperature requirements when you purchase your crab. Some crabs are more adaptable to a wider range of temperatures than others. If the aquarium will be set in a place that tends to be on the cooler side, you may need to use a heater. If the species of crab you’ve chosen requires brackish water, you’ll have to add a small amount of marine salt. Consult the directions on the package to make sure you get the ratio of water to salt right. Since crabs like to climb and explore, indulge them by providing some objects to play on. Sticks and rocks can do the trick, and you can also buy fun ready-made decorations from pet supply websites and pet stores. Some people like to put sections of piping (such as PVC pipe) in the tank for crabs to crawl on and hide inside. Just make sure there are no sharp edges that could hurt your pets. Once your habitat is ready, you can put the crabs inside! Here are some tips to help the process go more smoothly. Ideally, you should have the tank ready to go before bringing your crabs home. If your crabs arrive before their new home is completed, don’t leave them in a packaging container. Use plastic buckets or bins with a bit of filtered water in them to temporarily house your crabs. Remember to add an appropriate amount of marine salt if you have brackish water crabs. Take care not to let your crabs escape while they await placement in the aquarium. Once a tiny crab gets out of your sight, it’s extremely difficult to find – and it’s unlikely the crab will survive long after escaping. If you’re putting more than one crab in the habitat, observe their behavior for a while to ensure they won’t get too aggressive with each other. If they really don’t get along, you may have to remove one to a separate tank. Using a calcium supplement is also a good idea, as crabs need enough calcium to molt and grow healthy new exoskeletons. When you feed your crabs, watch carefully to see which foods they enjoy and which they don’t eat. Also, be sure to take out any old food that’s been lingering around the tank for more than a couple of days. A hungry crab may well nibble on some rotted food; this could potentially cause illness. When it comes to feeding, it’s better to start with just a bit and add more as needed. Adding too much food can cause potentially unhealthy conditions for your pet. It can also make your aquarium look and smell bad – and nobody wants that. Most freshwater crabs are non-aggressive, and can be placed with other peaceful fish and crustaceans. Small freshwater shrimp are often good neighbors for aquarium crabs. Just don’t put aggressive fish like cichlids in the same tank as your crab. When you purchase a new crab, talk to the breeder or pet store about which aquatic creatures they recommend placing with your pet. Always watch closely after introducing a new animal into your aquarium. Keep your crab’s habitat clean and healthy by performing regular water changes. Any time the water looks or smells dirty, get rid of it and add fresh (filtered) water in its place. You should also replace the sand as needed. The most common causes of disease and illness in freshwater aquarium crabs include unsuitable water conditions, poor diet, and contact with sick tankmates. Like other crustaceans, crabs shed their exoskeleton as they grow. The shed layer is replaced with a new one during the process. This is normal, natural, and necessary. Here are some signs to watch for, so you can tell your crab is preparing to molt. Your crab may eat its shed exoskeleton. Don’t be grossed out; this is actually a way for them to get enough vital calcium. You may note that some of the signs of molting are similar to the signs of illness. If you’re not sure whether your aquarium crab is sick or just molting, have an expert look at your pet to help guide you. Thoroughly wash everything before you introduce to your crab tank. If you purchase a used aquarium, wash and sanitize it before setting up the habitat. Crabs can regenerate missing legs and claws, so don’t be too shocked if you notice one is missing. It can take a few molting periods for the limb to full regrow. When you read about the size of a crab, know that the measurement generally includes only the carapace – which is the shell covering the main body of the crab. While these aquatic animals are not exactly a high maintenance pet, being a good crab keeper means spending time (and some money!) to make sure your pet has everything it needs to live its best life. In return, you’ll have a captivating little companion who is definitely worth the trouble.